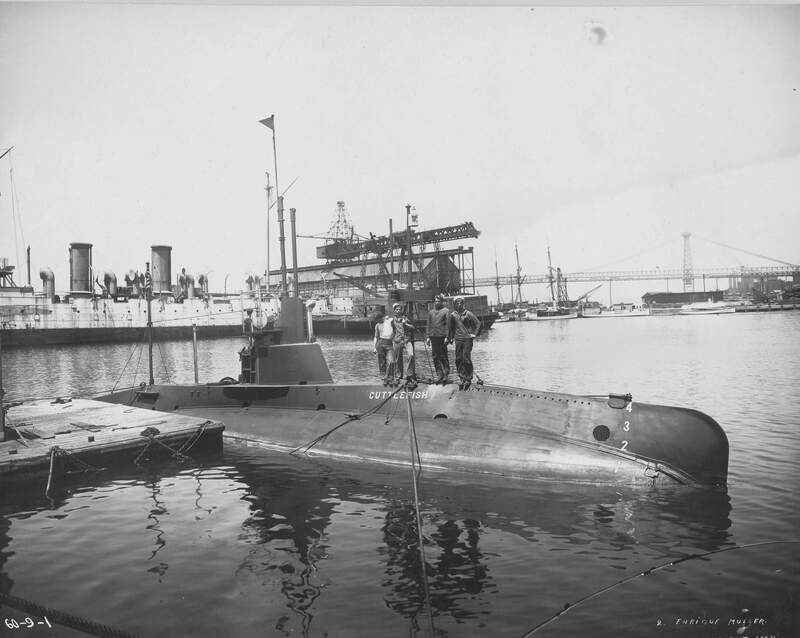 B Class Submarine: Laid down, 30 August 1905, at Fore River Shipbuilding Co., Quincy, MA. ; Launched, 1 September 1906; Commissioned USS Cuttlefish, 18 October 1907; Decommissioned, 30 November 1909, at Charleston Navy Yard, Charleston, SC; Recommissioned, 15 April 1910; Renamed USS B-2, 17 November 1911; Decommissioned, 4 December 1912; Recommissioned, 2 August 1913, at Cavite Navy Yard, PI; Decommissioned and struck from the Naval Register, 12 December 1919; Final Disposition, sunk as a target. Specifications: Displacement, Surfaced 145 t., Submerged 173 t.; Length 82' 5"; Beam 12' 6"; Draft 10' 7"; Speed, surfaced 9 kts, submerged 8 kts; Complement, 1 Officer 9 Enlisted; Armament, two 18" torpedo tubes, four torpedoes; Propulsion, gasoline-electric, Craig Shipbuilding Co. gasoline engines, 250 hp, Fuel Capacity, 1,880 gals, Electric Dynamic Co, electric motors, Battery Cells 60, single propeller. 1.94k Youngest Naval Sponsor Held Her Court at Meeting. The Cuttlefish (SS-11) was sponsored by Miss Eleanor Gow, daughter of Commander J. L. Gow. Image and text provided by Library of Congress, Washington, DC. Photo from The Washington Times. (Washington [D.C.]) 1902-1939, 21 February 1908, Last Edition, Image 6, via chroniclingamerica.loc.gov. 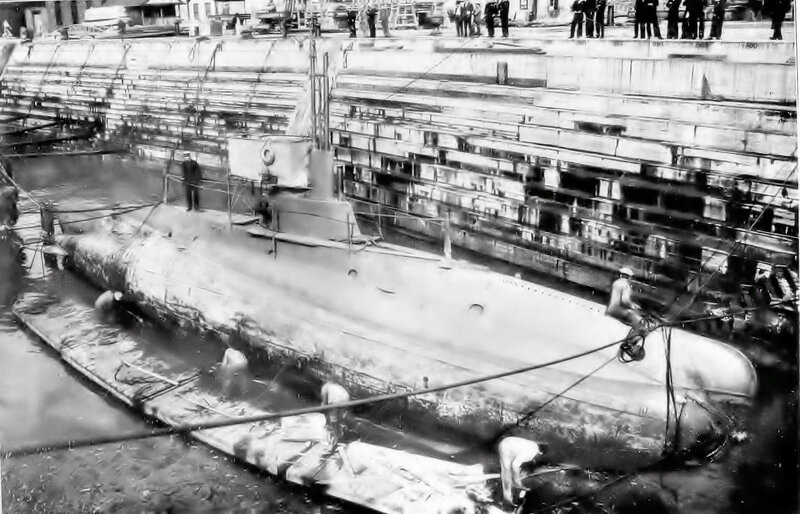 103k Launching of Cuttlefish (SS-11) at Fore River Shipbuilding Co., Quincy, MA. 1 September 1906. Photo courtesy of R.C. Richards, U.S. Submarines Through 1945, An Illustrated Design History by Norman Friedman. Naval Institute Press. Photo from The Sun. (New York [N.Y.]) 1833-1916, 22 November 1914, Image 38, via chroniclingamerica.loc.gov. 1.84k NEW SUBMARINES FOR OUR NAVY. 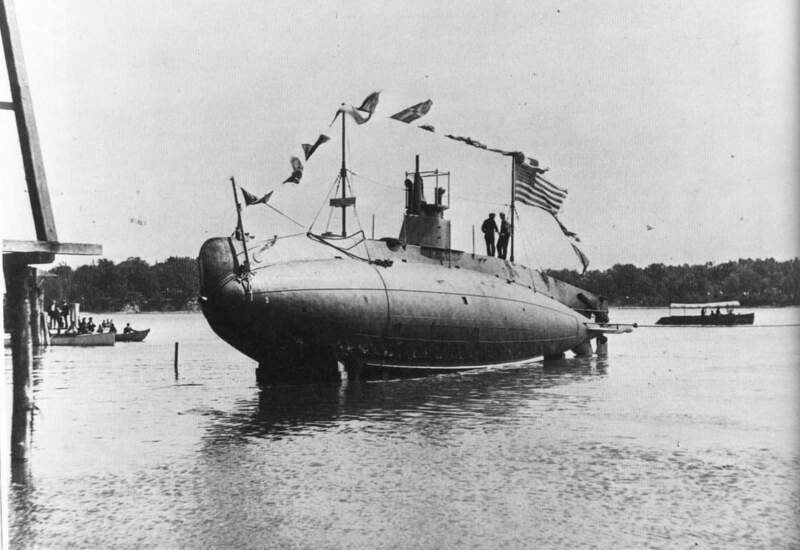 The submarine torpedo boat Cuttlefish (SS-11) which was launched at Gurney Mass. last week is one of the four Holland boats now being built for the government at that place. 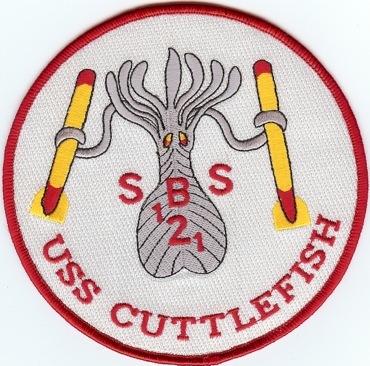 The dimensions and particulars of the Cuttlefish are held as confidential by the navy department but it is known that it is to be larger and faster than the Holland boats now owned by the government. Image and text provided by University of Utah, Marriott Library & Library of Congress, Washington, DC. insert photo from Evening Star (Washington, D.C.) 1854-1972, 02 September 1906, Image 13, & Desert Evening News. (Great Salt Lake City [Utah]) 1867-1920, 22 September 1906, Last Edition, Part Two, Image 26, via chroniclingamerica.loc.gov. 1.68k WARNED by costly accidents, UNCLE SAM will substitute submarines for HARBOR mines in his SCHEME of costal DEFENCE. Image and text provided by Library of Congress, Washington, DC. Photo from The Washington Times. (Washington [D.C.]) 1902-1939, 07 October 1906, Magazine Section, Image 40, via chroniclingamerica.loc.gov. 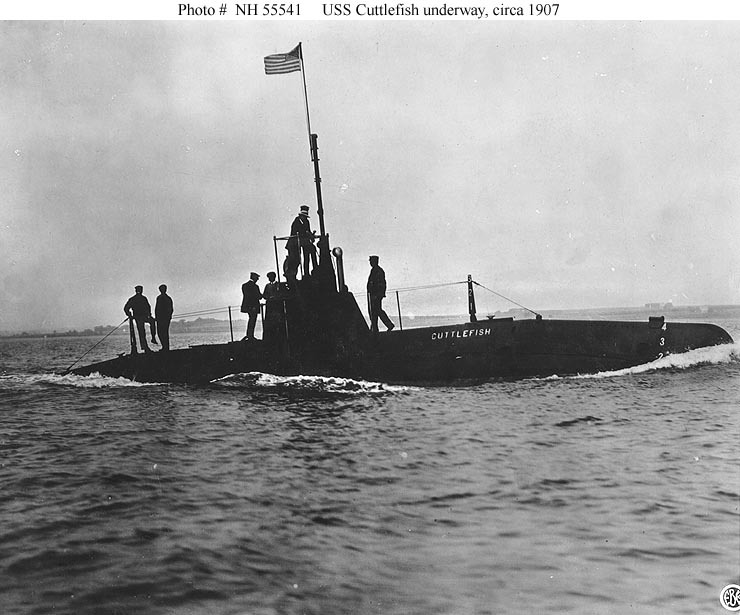 76k Cuttlefish (SS-11) underway, circa 1907. Photographed by the Electric Boat Company, Groton, Connecticut. U.S. Naval Historical Center Photograph # NH 55541. 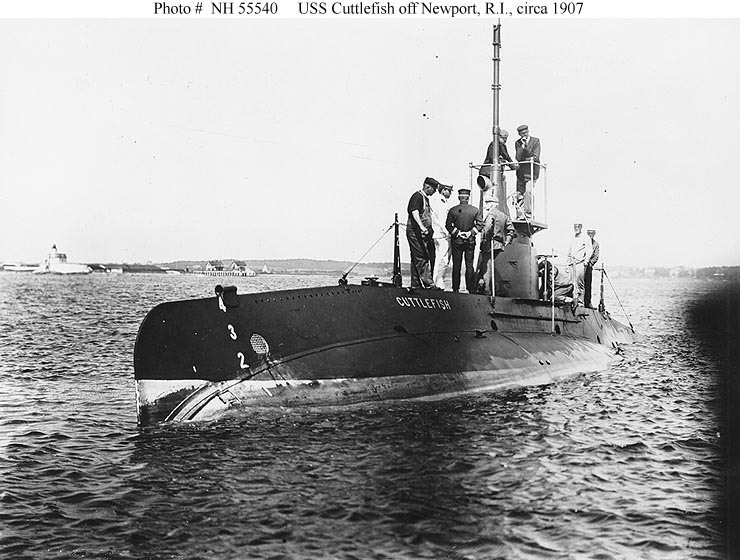 92k Cuttlefish (SS-11) off Newport, Rhode Island, circa 1907. U.S. Naval Historical Center Photograph # NH 55540. 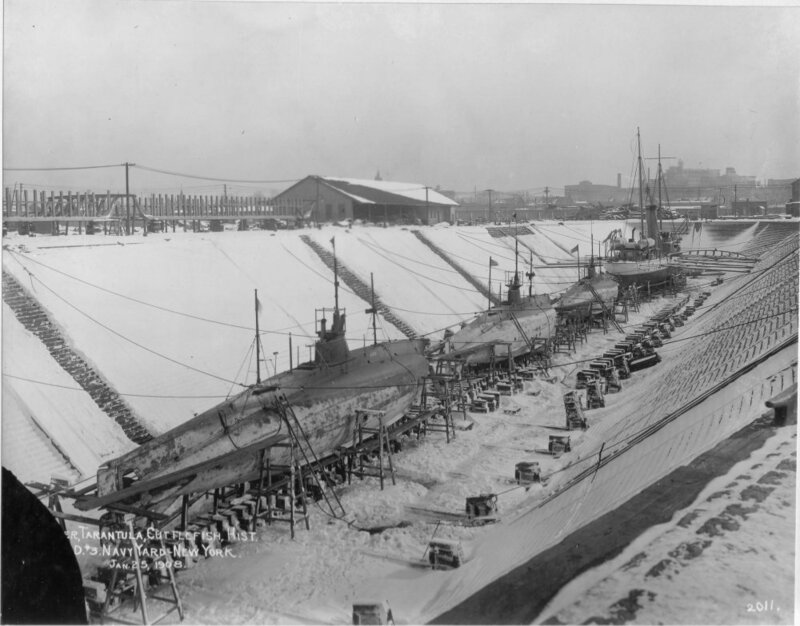 103k The three B-boats (SS-10/12) (Inboard) Cuttlefish (SS-11), Tarantula (SS-12), and Viper (SS-10) share a snowy dry dock at the New York Navy Yard, 25 January 1908. 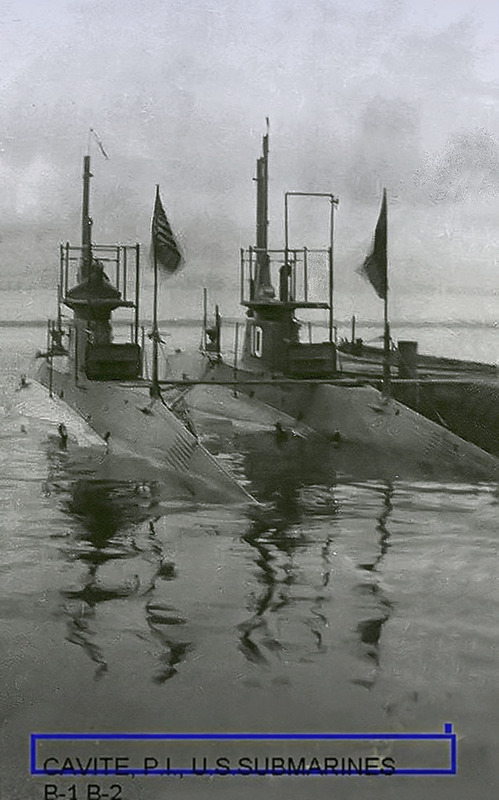 Note that each one still has a single fixed periscope, with a flagstaff above it. Boats running submerged flew flags on these staffs to warn surface ships against running them down. Note, too, the running lights affixed to boards on the foremasts. Collection of Rear. Admiral Henry Williams. U.S. Naval Historical Center Photograph. Text courtesy of U.S. Submarines Through 1945, An Illustrated Design History by Norman Friedman. Naval Institute Press. 221k The B-boats of the Viper class: Viper (SS-10), Cuttlefish (SS-11),& Tarantula (SS-12), the ultimate development of the single screw Holland design, introduced a much more extensive superstructure for sea keeping. As designed, Viper had only the single periscope shown, as in Plunger, it was let into the conning tower. A second (hull) periscope was later added. Engine gearing had been abandoned, the propeller shaft no longer coincided precisely with the axis of the hull. Air compressors and main bilge pumps were driven from the main shaft via clutches and gears; they could be operated by either the motor or the engine. Note that, in a boat this small, a reload torpedo occupied much of the hull. Collection of Rear. Admiral Henry Williams. U.S. Naval Historical Center Photograph. Text courtesy of U.S. Submarines Through 1945, An Illustrated Design History by Norman Friedman. Naval Institute Press. 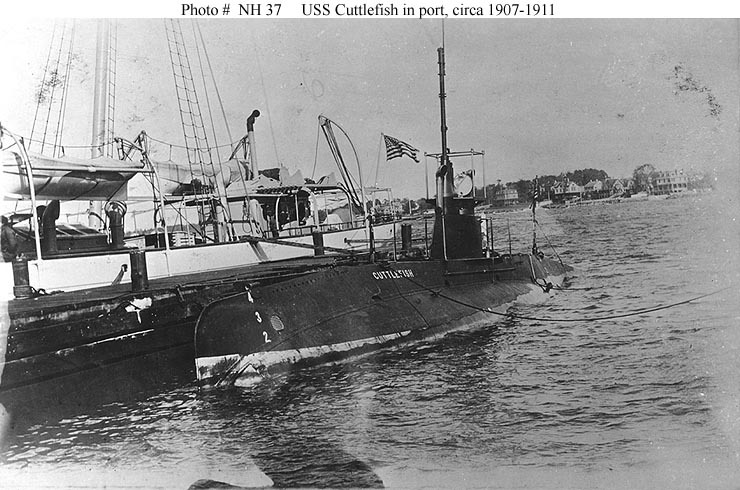 102k Cuttlefish (SS-11) in port, circa 1907-1911. U.S. Naval Historical Center Photograph # NH 37. 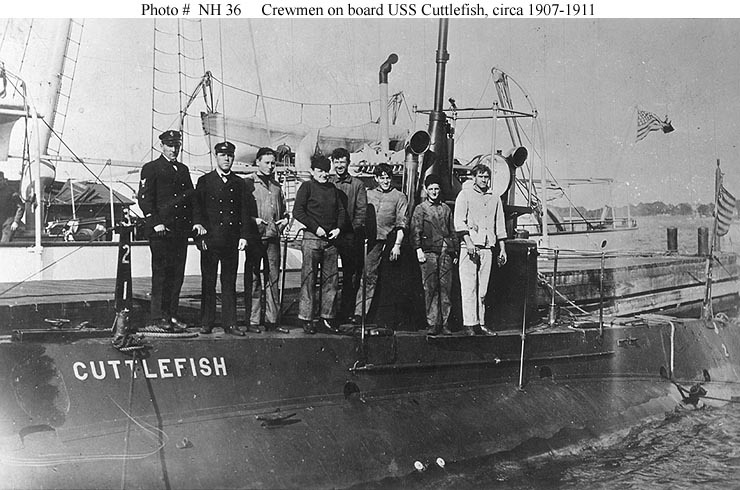 101k Cuttlefish (SS-11) in port with crew members on deck, circa 1907-1911. U.S. Naval Historical Center Photograph # NH 36. 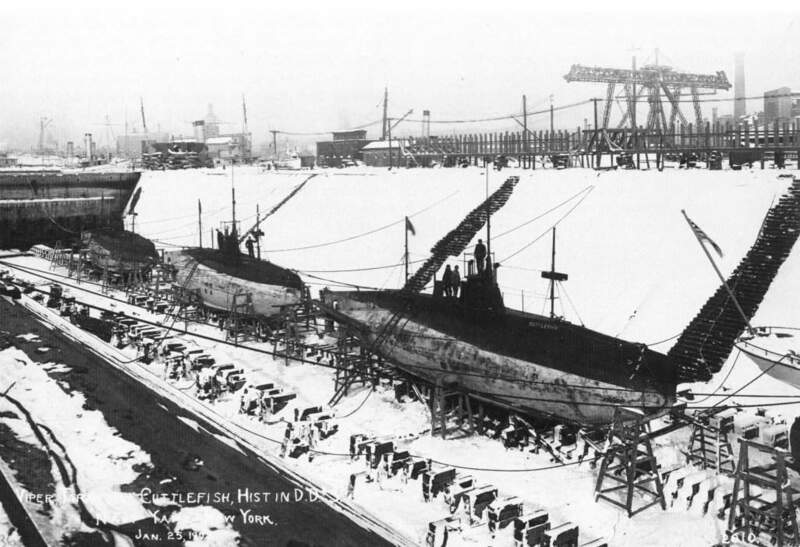 470k Viper (SS-10), Cuttlefish (SS-11) and Tarantula (SS-12) lie together in dry dock at the New York Navy Yard, 25 January 1908. NARA (National Archives and Record Administration) photo # 19N-15-28-6, courtesy of Daniel Dunham. 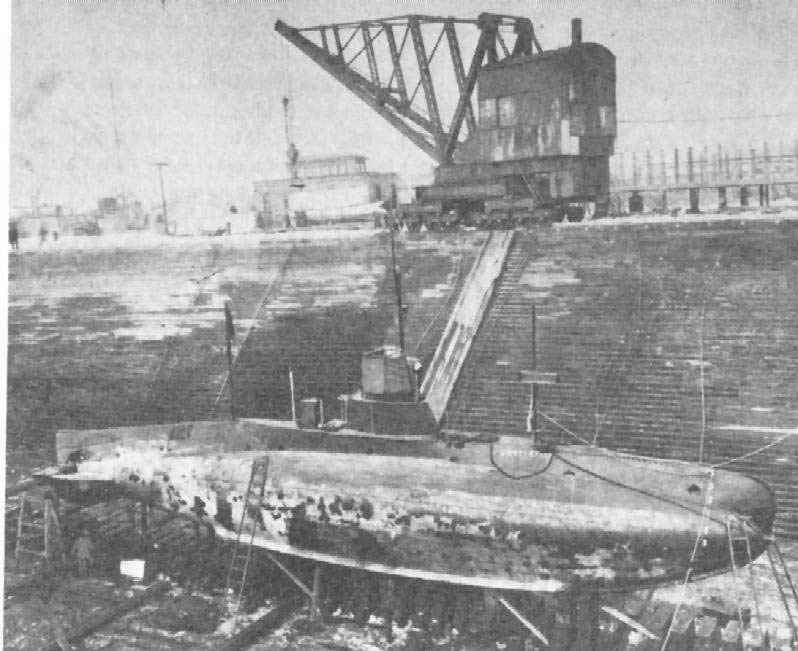 85k The Cuttlefish (SS-11), probably in dry dock at the New York Navy Yard, 25 January 1908. Courtesy of Robert Hurst. 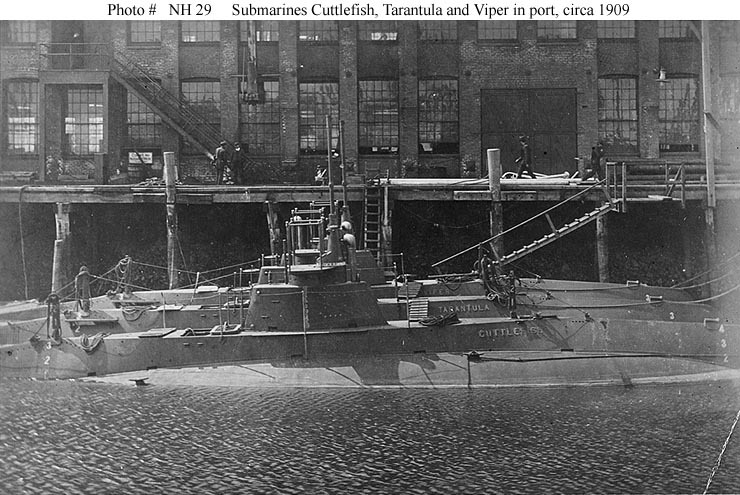 109k Cuttlefish (SS-11), Tarantula (SS-12), and Viper (SS-10) in port, circa 1909. U.S. Naval Historical Center Photograph # NH 29. 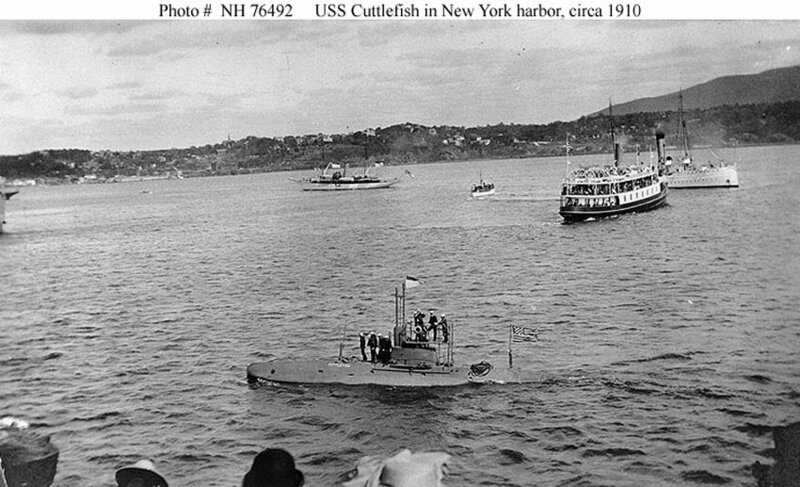 122k Cuttlefish (SS-11) participating in a naval review in New York Harbor, circa 1910. U.S. Naval Historical Center Photograph # NH 76492. Digital ID # 19799, LC-F81-2433. Source: Library of Congress Prints and Photographs Division, National Photo Company Collection. AIR HEAVY WITH GASOLINE. A CHIEF CAUSE OF TROUBLE. 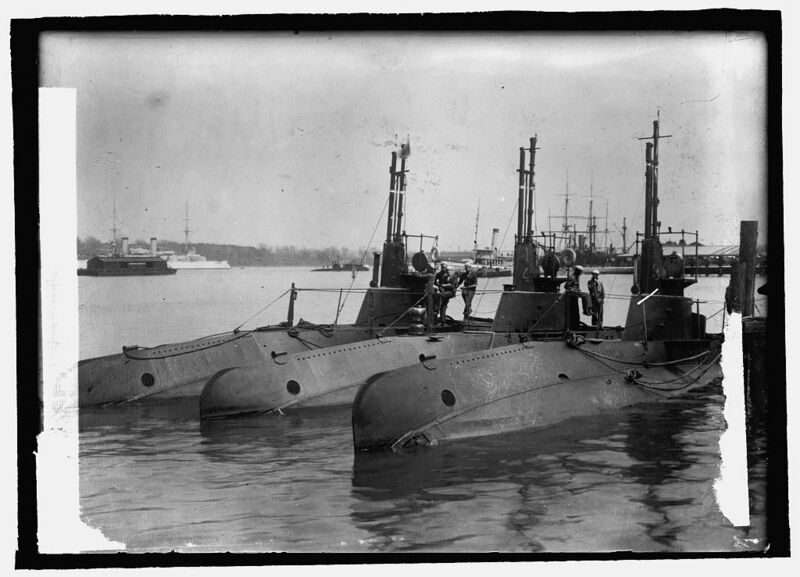 THE SUBMARINES TARANTULA (SS-12) & CUTTLEFISH (SS-11) MOORED IN THE BASIN OF THE NAVAL ACADEMY. THE OLYMPIA (C-6), DEWEY'S FLAGSHIP AT MANILA, IN THE OFFING. Image and text provided by The New York Public Library, Astor, Lenox and Tilden Foundation. Photo from The Sun. (New York [N.Y.]) 1833-1916, 10 July 1910, Third Section, Image 29, via chroniclingamerica.loc.gov. 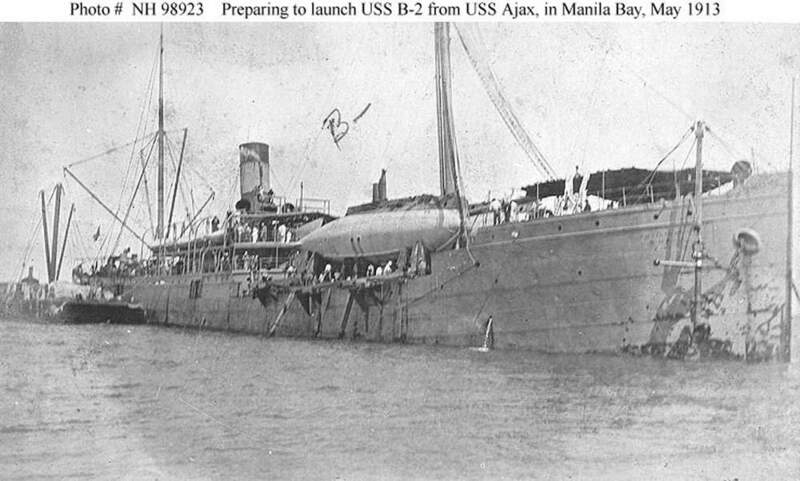 82k Ajax (AC-14) in Manila Bay, Philippine Islands, preparing to launch B-2 (SS-11) from her deck, circa 12 May 1913. 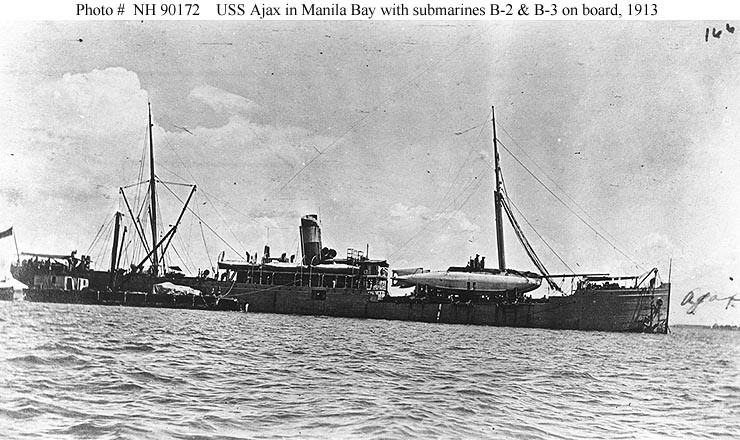 Ajax had transported B-2 and B-3 (SS-12) to Manila from Norfolk, Virginia. U.S. Naval Historical Center Photograph # NH 98923. 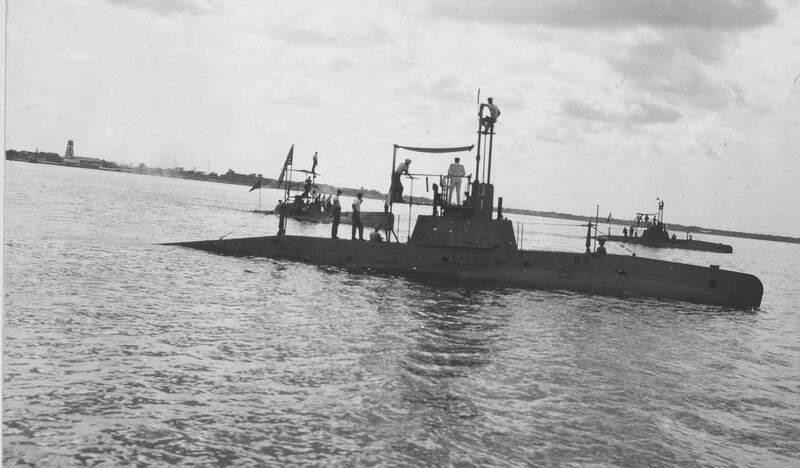 97k B-3 (SS-12) lies in Manila Bay after her voyage from Norfolk with B-2 (SS-11) as deck cargo, forward, in late April or May 1913, before they were launched from her deck. USNHC photo # NH 90172, from the Philip H. Wilson Collection, submitted by Joe Radigan, MACM USN Ret. 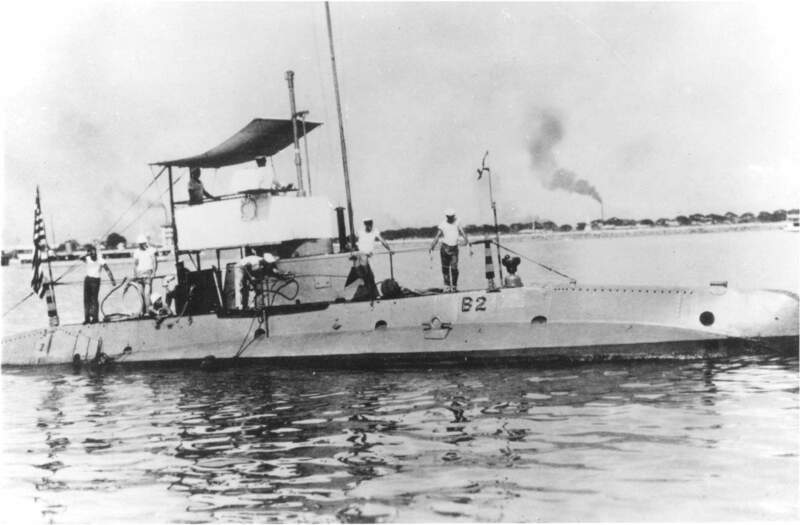 80k B-2 (SS-11) off the Cavite Navy Yard, Philippine Islands, with an awning rigged and crew members on deck, circa 1913-1917. U.S. Naval Historical Center Photograph # NH 63093. 80k B-2 (SS-11) and General Alava (AG-5) in Philippine waters, prior to World War I. Courtesy of Donald M. McPherson, 1977. U.S. Naval Historical Center Photograph # NH 85719. 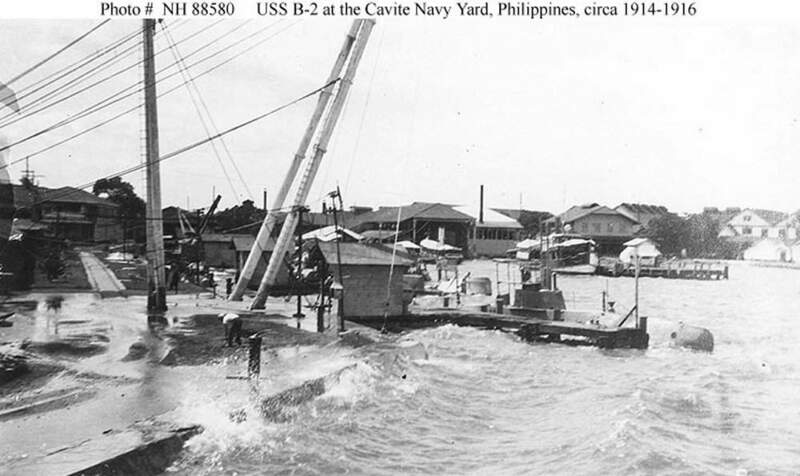 72k Cavite Navy Yard, Philippine Islands. View on the waterfront, with a rather rough sea running, circa 1914-1916. B-2 (SS-11) is alongside the pier in right center. U.S. Naval Historical Center Photograph # NH 88580. 67k B-1 (SS-10), (inboard) & B-2(SS-11) at the Cavite Naval Base, Philippines, 1916. Photo courtesy of Vern Maxson, LCDR(SS), USNR-Ret.Photo fix by Jim Keeling.